First Brethren Church in Buena Vista will have an old-fashioned Homecoming on Sunday, October 12, 2008. The Homecoming Worship Celebration begins at 10:00 a.m. A potluck fellowship dinner follows at 12:30 p.m. in the church’s fellowship hall. During the service an Infant Nursery, Toddler Church and Children’s Church will be provided. Rev. Steve Shipley, a former Associate Pastor at First Brethren and now a pastor in Fort Myers, Florida, will be the guest speaker. 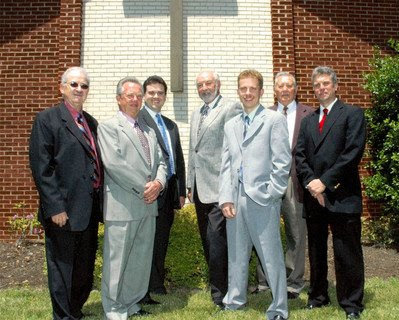 Special guests for the service will be The Brethren Four (pictured), a popular local quartet. With this Homecoming, First Brethren Church celebrates 118 years of service in Buena Vista. Founded in 1890, it is part of the Fellowship of Grace Brethren Churches. The church offers Sunday School classes for every age and has an active children’s and youth program. Renovations were recently completed on the youth center and Youth Game Nights will begin Saturday, October 11, from 7-10 p.m.
Due to the Homecoming celebration there will be no evening service on October 12. First Brethren Church is located in Buena Vista at 100 E 29th Street (U.S. 60 E). Assisted listening devices are available and the church is handicapped accessible. For more information call 261-6425.